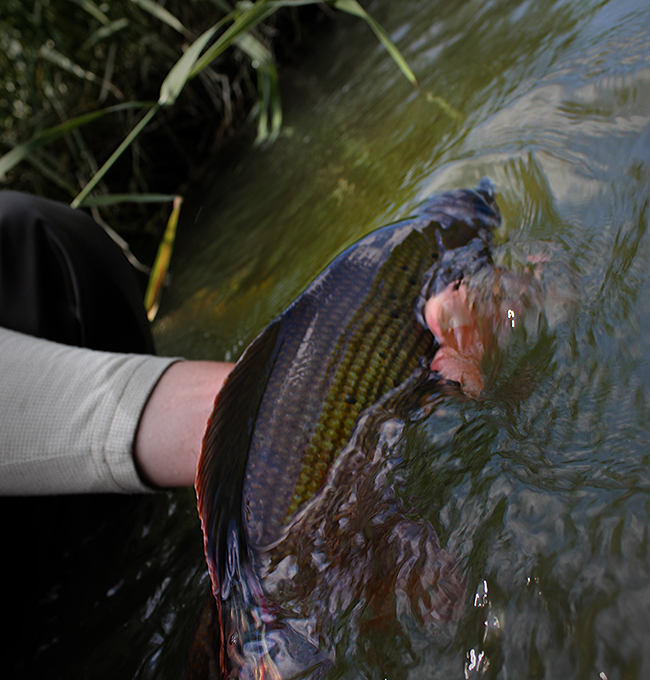 A San River grayling lives to fight another day. These were just a few of the sentences I heard on loop during a recent prolonged fishing trip to Poland. It was a trip I had been thinking about for years: to start in the West of a country I had often visited but never flyfished and hop-scotch mountain ranges until I ended up near the Ukrainian border—the wild, wild East. I was expecting to catch fish on this trip—trout, grayling and, if I was lucky, a huchen. I was expecting to behold magnificent mountains and even more magnificent sausage. But I wasn’t expecting to have my God-Blessed American fly fishing ethos questioned every step of the way. It started on the Dunajec River, a mountain stream very much resembling the Madison, if the Madison’s banks were flush with goats and goatherds. My fishing partner for the day was Mirek Pieslak, editor-in-chief of Poland’s first fly fishing magazine, Sztuka Lowienia. He said he’d begin with some short-line nymphing. I announced I would start by throwing streamers. In the weeks before the trip I had bragged to friends that I was going to introduce Michigan-style streamer fishing to the Carpathians, and I aimed to do just that, starting with a Drunk and Disorderly, a fly tied by my friend Tom Lynch. Laid out on my arm, it takes up most of the real estate between my elbow and wrist. I fished that fly for about half an hour, swinging, stripping, stuttering and swooning. That was long enough to know that it just wasn’t working. It was also long enough to see that something else was. By my casual estimate Mirek had caught about 20 trout. It seemed every time I looked downstream he was landing another fish. Another good fish. I quickly switched over to my short-line nymphing rig, a set-up most of us in the U.S. know as Czech Nymphing (in that there is contention between Poles and Czechs about who invented it first, and in that I plan to return next year, I’m going to call it short-line nymphing). I should tell you that I had been short-line nymphing for years, and had had a fair amount of success fishing Wisconsin’s spring creeks with it. I had even hooked—and promptly lost—a Pere Marquette steelhead with the technique. But as I started to fish, I found myself only catching—no exaggeration—one fish to Mirek’s 15. After an hour I finally approached him. Clearly I was doing something wrong. It was a problem I’d had as a high school ball player. For some reason or other, it was important that I wield the biggest bat on the team, a bat locally referred to as “The Beast.” And for a year or two—before I started fishing too much and was promptly made to keep the bench from getting dusty—I hit the stuffing out of the ball. But a lot of those hits, even the long balls, came after I got a chiding from my coach: “Choke up on that bat. Improve your control.” And that’s really what Mirek’s comments boiled down to: doing more—and doing it better—by working with less. Less water. Less fly line. Shorter leaders. “You made your first mistake before you made your first cast,” Mirek said. He pointed out that in wading to what I perceived to the the best holding water—a nice slot about 30 feet off shore—I had blasted through innumerable fish holding in the shallows. We went downstream a bit to test his theory. “Fish right there,” he said, pointing to the water directly in front of me. Problem was, I was standing just three feet off the bank. The water at my feet didn’t come close to my knees. Sure, it was broken water, but I could just about see the bottom. Nonetheless, I pitched my nymph rig upstream. With a strategically concealed eye-roll, I tossed my nymph upstream and followed it as it ticked past my boots. I could actually see the orange and black of my point fly as I lead it along. Then my line stopped. I lifted. And my rod did the opposite of lift. There was eighteen inches of brown trout on the end of my line. It was the first lesson in an enligthening week of fishing. I had previously been under the impression that the short-line game was for people who couldn’t cast or mend. That it was the opposite of creative. I was wrong. Having complete control gave me the opportunity to improvise. I would make three drifts before moving my feet: once on the bottom, once through the middle of the column, once with some movement, a subtle jigging action. I went from striking out to getting base hits with consistency. And as anyone who has played baseball will tell you, once you’re connecting regularly with a compact stroke, it’s only a matter of time before some of those connections end up going over the fence. For me that happened on the banks of the San River, a cold-as-freon, flies-only paradise, in the form of my third grayling. Ever. I had worked the run twice already but decided to give it one last drift, this time through the middle of the column of water in case any aggressive fish were suspended. A second later my line took off. Mirek and I followed—first at a walk, then at a tear. It was a grayling, a huge grayling, and once its massive dorsal went up—less a fin than a sail—there was little my four weight could to do corral it. But eventually it came to net. This one goes out to those guys who like to really bomb it out. Who go straight for the sweet spot. Who use 14 foot leaders. There is certainly a time and a place for those things. But there are also times when a little restraint, and a whole lot of extra control, just might be your meal ticket. Next time you’re out, experiment with how close in you can fish and still be successful. You might just be surprised. And it might just add a handy dimension to your game.